A new study reveals that a large share of these emissions are embedded in traded agricultural and forestry commodities, mainly palm oil, soy, cattle (beef and leather) and timber products (including paper). 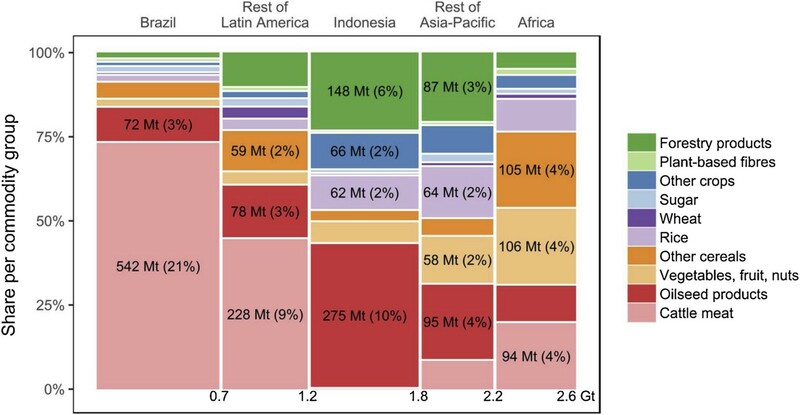 An open-access paper published in the May 2019 edition of the journal Global Environmental Change and now available online shows that 2.6 GtCO2 of net emissions per year were attributable to tropical deforestation in the period 2010–2014, and more than half of these emissions were linked to production of cattle and oilseed products, most notably soy and palm oil. The paper shows that between 29% and 39% of total deforestation-related emissions in the period were embedded in internationally traded commodities, depending on the trade model used. This is much larger than the share of fossil carbon emissions embedded in trade. Efforts to reduce greenhouse gas emissions from land-use change thus need to consider the role of international demand in driving deforestation. Javier Godar, Senior Research Fellow at Stockholm Environment Institute (SEI) and co-founder of Trase, is one of the authors of the paper. The work was led by Florence Pendrill and Martin Persson of Chalmers University, in collaboration with researchers from the Senckenberg Biodiversity and Climate Research Centre in Germany, and the Norwegian University of Science and Technology (NTNU). According to Godar, the study is a major step towards understanding the role of the international trade in agricultural commodities in global emissions, because for the first time it looks at all tropical countries, and also calculates the emissions for both direct, physically traded flows and the consumption of more complex products in which the agricultural commodities are embedded. “The most striking result is related to the fact that for many consumer countries, mostly developed countries, the deforestation emissions embedded in imported tropical agricultural commodities they consume rival the emissions from their own agricultural sectors. This underscores the need to include extra-territorial emissions in national accounting, and for consumer countries to support and finance anti-deforestation policies and more sustainable farming practices in producer countries”, he says. The paper also shows great variation between countries and commodities in the share of deforestation-related emissions embedded in exports. For example, Latin America exports 23–34% of its emissions. Of these, 71–89% are in oilseeds and 11–21% in cattle meat. The Asia-Pacific region exports a higher share of its emissions (44–49%), and Africa a lower share (9–32%). Worldwide, oilseed exports account for 62–76% of the embedded deforestation-related emissions, mostly coming from Asia-Pacific and Latin America to Europe, China and the Middle East. The same holds for the “other crops” commodity group, which includes high-value crops such as cocoa, coffee, tea and spices, with 68–75% of emissions exported. The study findings highlight the importance of taking deforestation into account when assessing the carbon footprint of agricultural commodities from the tropics. It traces the emissions embedded in traded commodities through global supply chains to export markets. Europe and China are the major importers of cattle and oilseed products from the tropics, and for many developed countries, deforestation emissions embedded in imports rival or exceed emissions from domestic agriculture. During 2010–2014, deforestation accounted for around a sixth of the carbon footprint of the average diet in the European Union (EU). Finally, the authors discuss how the findings could inform mitigation policies. For example, they reinforce the idea that efforts to reduce tropical deforestation should focus on a handful of commodities and trade relationships. The authors suggest that carbon taxes on food products in export markets could help to address the deforestation carbon footprints of some agricultural and forest products. “If you give tropical countries support in their work to protect the rainforest, as well as giving farmers alternatives to deforestation to increase production, it can have a big impact”, adds lead author Florence Pendrill. However, the authors stress that interventions in producer countries are essential, as domestic demand still accounts for more than half of deforestation-related emissions. The study was partly funded by PRINCE, a project that explored new consumption-based indicators for Sweden.